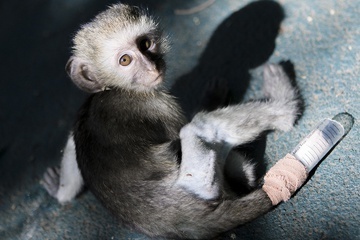 When young vervet monkeys need medical help, the staff at the Vervet Monkey Foundation are always at the ready. 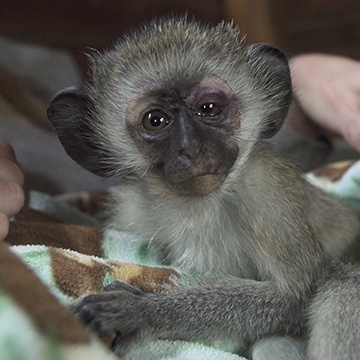 The Christmas Eve rescue began like so many others at the Vervet Monkey Foundation (VMF). Dave Du Toit is the founder of VMF, a PASA member sanctuary in South Africa. And when his cell phone rings, staff thinks a single, collective thought: uh oh. That’s because a call often means that a young monkey is in big trouble. And there are many ways that can happen. Thankfully, the farmer on this call was trying to help. He was bringing in a baby vervet who’d been attacked by a dog. See Dumbo shortly after his arrival at VMF. Infants and juveniles who have recovered but can’t be reintroduced to their troop eventually go to Disneyland, the affectionate term VMF uses for its nursery, where babies take comfort in socializing with other babies. 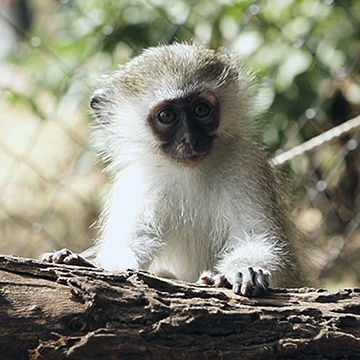 Eventually, everyone is introduced to a vervet foster mother. See Stick’s arrival and initial care at VMF. And as for Pool Boy, he was reunited with his troop just one day after falling into the pool. But a juvenile named Kambi had to wait longer for her family reunion. So two months after her rescue, the decision was made to amputate the arm, a procedure she seemed to bounce back from almost immediately. Once she’d fully recuperated, Kambi was released back to her troop. Whenever that happens, Megan says, staff can’t help but wonder how the monkey is doing. That was especially true in Kambi’s case. And then Dave got a call. 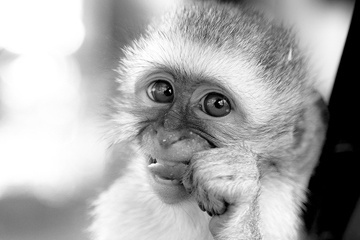 Click here to support Vervet Monkey Foundation.